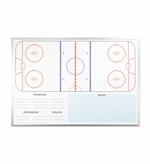 With many options to choose from we have the right hockey coaching board for you. 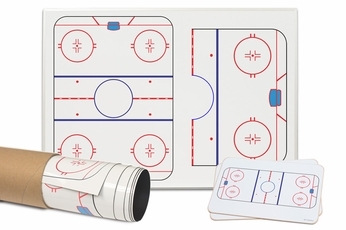 Whether you want one for the bench, the locker-room, or a roll up magnet to take on the road, our high quality hockey whiteboards will look great and erase clean as you teach your team the fundamentals of the game. Whether it's a handheld boards a wall-mounted one or a roll up magnet all of our boards feature vibrant full-color OptiPrint graphics and high quality dry erase surface that not only erases clean but will for many seasons to come. Want to customize your new hockey dry erase board? We can do that and have for many coaches, we can add your team logo or customize it anyway you wish. Either create a custom board or give us a call at 1-877-393-0111 and we will get you started. 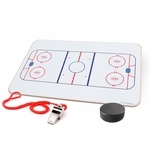 Non-Magnetic ice hockey boards with the same great writing surface. 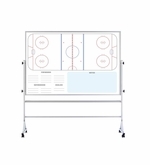 Wall mounted magnetic dry erase board with full ice hockey rink and half ice.